BASSETERRE, ST. KITTS, SEPTEMBER 25TH 2005 (CUOPM) – The timing of the 12th Annual Florida Caribbean Cruise Association (FCCA) Conference, at this time in the Federation’s economic history, is a significant opportunity for the islands and its people. “Our destination will be on show and we all stand to benefit from a successful hosting of the conference let us rally to demonstrate that we are the premiere cruise destination in the Caribbean,” said Prime Minister Douglas. 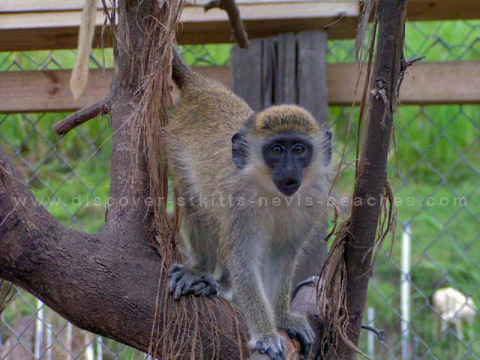 Photo # 1 – St. Kitts and Nevis Prime Minister Dr. the Hon. 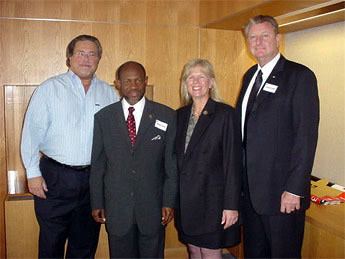 Denzil L. Douglas (second from left) during a visit to Miami in 2004 with Chairman and CEO of Carnival Corporation and Chairman of the Florida-Caribbean Cruise Association (FCCA), Mr. Mickey Arison (left); President of the Florida-Caribbean Cruise Association (FCCA), Ms. Michelle Paige (third from left) and Vice President for Caribbean and Atlantic Shore Operations for Princess Cruises, Steve Neilsen (right) after discussing the possibility of St. Kitts and Nevis hosting the FCCA Conference.